I think it is safe to assume that one hundred years ago things were quite different. That is about the extent of my historical knowledge: a long time ago things were really different than now, and more recently things were a little less different. But in different ways. Deep, I know, but lacking some important details I admit. Luckily there are sites like Wikipedia, where historically accurate or not, you can find all sorts of information on what was happening 100 years ago. For example, New Mexico became a state in 1912. This may come as little surprise, but I didn't know that. Fenway park in Boston hosted its first baseball game 100 years ago, making it baseball's oldest stadium. That I did happen to know, mostly because it was on TV. And the Titanic both set sail and hit an iceberg 100 years ago. 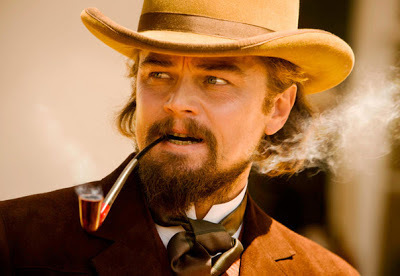 I might have guessed that because I thought Leonardo DiCaprio was looking a little old these days. Wait, didn't he drown? He really is resilient. So maybe things haven't changed all that much after all. Once again, the internet has caused me to re-think history and facts as I know them: Leo is still flourishing in his acting career, people still venture out on large boats through fields of icebergs, New Mexico is still a state and the Red Sox are still losing to the Yankees. Maybe things are exactly as they were 100 years ago. 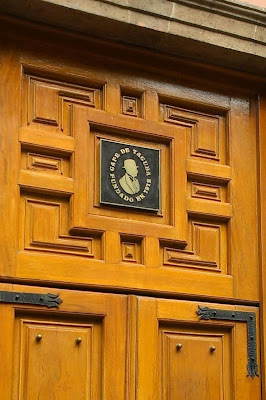 This point is reinforced at Mexico City's Cafe de Tacuba, which turned 100 on December 13, 2012. 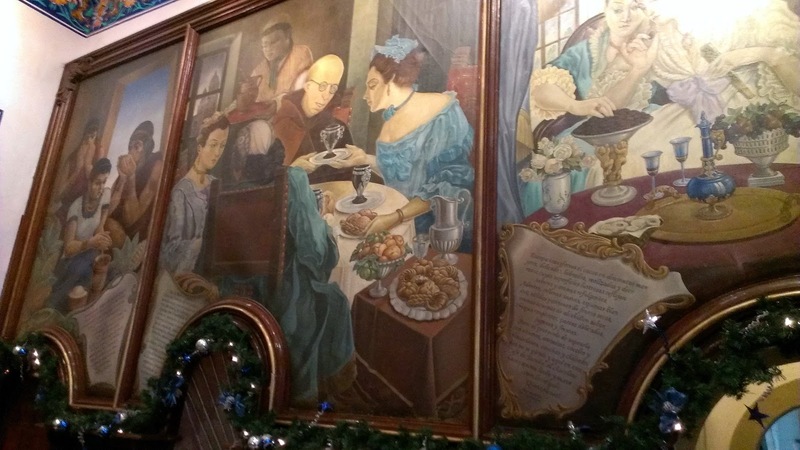 Cafe de Tacuba has always been a favorite of mine, and my wife and I make a point of visiting almost every time we are in the capitol city. We happened to walk in on the aforementioned anniversary date, and true to its timeless nature, didn't notice anything different about the place: Same straightforward but well-executed menu. 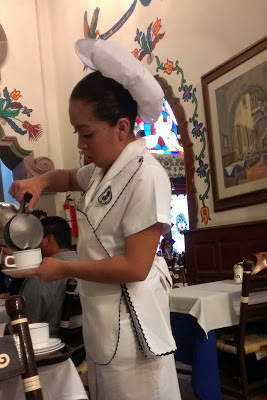 Same waitresses and hosts dressed in historic outfits. Same intricate azulejos tile-work. Same shimmering stained glass windows. Same historic paintings, from a distinguished portrait of the legendary (and wonderful, I might add) poet Sor Juana Ines de la Cruz to gastronomic-themed oils depicting the "discovery" (by Europeans) of chocolate and mole. 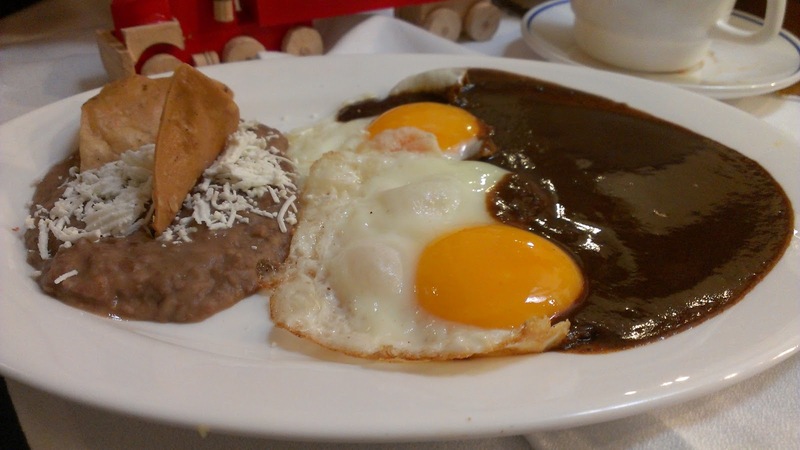 We did end up ordering both mole and chocolate--my wife with the latter, a thick-though-light, creamy and decadent hot chocolate Me, a plate of huevos con mole. My mole was fantastic, embodying all the desirable characteristics of a slowly cooked, carefully prepared chocolate-forward mole: sweet, bitter, pungent, rich and ever-so-slightly spicy. I happily mixed it in with my beautifully fried eggs, done Mexican-style, so the bright yellow yolk just warms, but runs every which way on the plate. 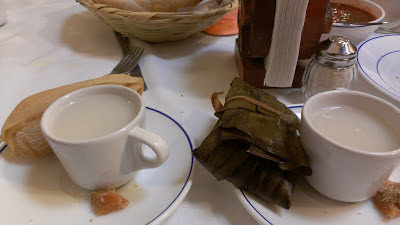 They also brought us each a tamal and a little cup of atole, a sweet masa-based hot drink popular around the holidays. The tamales included red and green versions with pork and chicken, as well as a divine tamal de mole. It was another great meal, made even greater by the fact that they were giving every table a 50% discount as well as a coffee mug marking the historic occasion. Not too many restaurants last 100 years. Colorado's Buckhorn Exchange has made it 119 years at last count, but these days making through the first year can be difficult enough. As trends come and go and as bubbles continue to burst, it is nice to see the lasting power of a place like Cafe de Tacuba. Next time you're in Mexico City, take a step back in time and visit them. 100 years of doing it right means you are unlikely to be disappointed. Cafe de Tacuba is located on, well, calle Tacuba just steps from the Metro Allende and a short jaunt to the Zocalo. 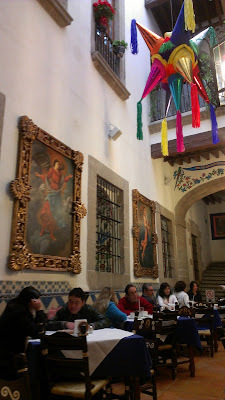 In my one trip to Mexico City, I walked passed but did not go into Cafe de Tacuba. Because of my preconceived notions, I was looking for something more "authentic." Sometimes my preconceived notions can turn me into a real dumbass. 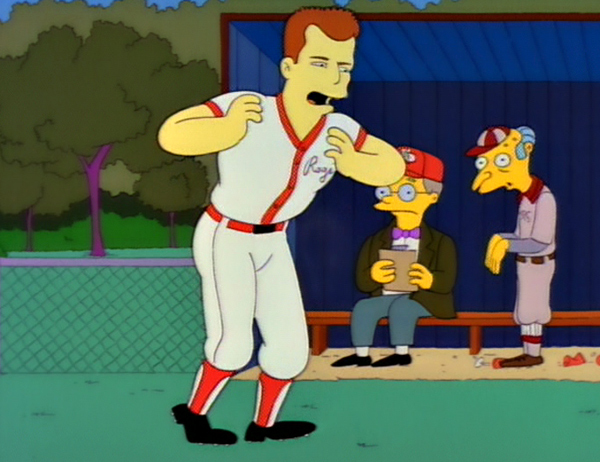 Loving the simpsons picture in here!